This clamshell-shaped deepwater lionfish trap, designed by Steve Gittings, chief scientist for NOAA's Office of National Marine Sanctuaries, will soon be tested in Bermuda's waters as part of a multi-year investigation into the effectiveness of various lionfish-removal methods. Photo credit: Steve Gittings, NOAA. It is often said that good things come in groups of three, and that might be the case for a trio of research projects aimed at reducing a recent, but growing, threat to Bermuda’s marine biodiversity: the invasive lionfish. While many invasive species disrupt natural ecosystems by spreading disease or competing for food and habitat, lionfish are particularly problematic owing to their voracious appetites and high reproductive capacities. Lionfish are indiscriminate predators, feeding on over 70 species of fish, invertebrates, and mollusks, and a single lionfish can eat 30 times its stomach volume in one meal. Additionally, each female lionfish can produce more than two million eggs each year during her average 16-year lifespan, making lionfish a significant threat to native fishes and reef systems throughout the Caribbean and Western Atlantic Ocean, including Bermuda. In a multi-pronged effort to address this issue, local organizations—including the Ocean Support Foundation, Groundswell, and the Bermuda Lionfish Taskforce—have individually and collectively engaged in projects to educate the public and promote the active removal of lionfish. However, much remains unknown about how lionfish are distributed in Bermuda’s marine environment, as well as what methods of removal are most effective at preserving biodiversity and preventing lionfish recolonization. Gretchen Goodbody-Gringley is a reef ecologist at BIOS whose current research projects include studying the ecological impacts of the invasive lionfish, with a particular focus on mesophotic reefs, which grow at depths between 98 to 492 feet (30 to 150 meters). Last September Goodbody-Gringley and research specialist Tim Noyes in the BIOS Coral Reef Ecology and Optics Lab received funding from the BEST 2.0 Programme (part of the European Union Biodiversity for Life flagship) to demonstrate the impacts of targeted lionfish removal on local reef fish populations. 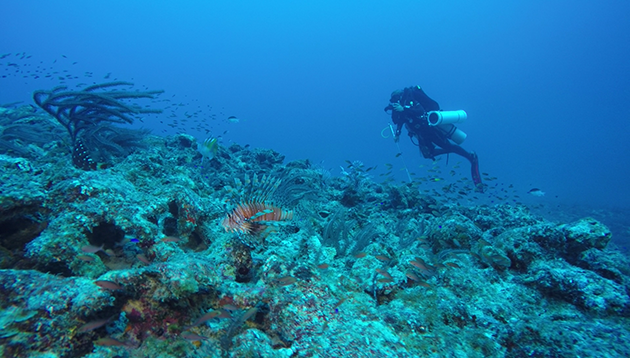 For six months, Goodbody-Gringley and Noyes surveyed fish populations and lionfish densities at three mesophotic reef sites in Bermuda. They then speared the lionfish to remove them from the reef and collect biological samples, such as clips of fin tissue, which are used to study lionfish population genetics. By comparing the fish communities at these three survey sites to “control” sites, where no lionfish were removed, the team hopes to shed light on how native fish populations respond to targeted lionfish culling. “Results from this study can be used to guide future management and control plans, in terms of how much effort is required and what types of methods must be employed in order to have an impact,” Goodbody-Gringley said. Goodbody-Gringley uses a lionfish containment device to collect fish that she spears on one of Bermuda's mesophotic reefs. This targeted removal is being studied as one possible mechanism for controlling the invasive lionfish population and protecting local fish diversity. Late last year, around the same time fieldwork concluded on the lionfish removal project, Noyes, Goodbody-Gringley, and BIOS molecular ecologist Leocadio Blanco-Bercial received word that BEST 2.0 funded a separate, yet complementary, project. This new project aims to determine the effectiveness of a lionfish-specific trap, developed by the U.S. National Oceanographic and Atmospheric Administration (NOAA) and designed to remove lionfish while preserving native fish biodiversity. 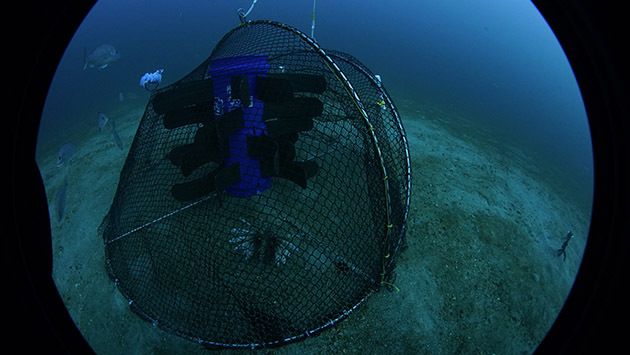 The baitless trap, approximately six feet in diameter and shaped roughly like a clamshell, is designed to act as an “aggregation device” that attracts lionfish to the center of the trap by providing three-dimensional structural habitat. The trap remains open until scientists retrieve it, capturing only the fish in proximity to the aggregation device. With no bait present to attract other fish, the likelihood of catching other species, called “bycatch,” is significantly reduced. Using the same survey sites as the first project, the team will deploy the trap for consecutive 10- to 14-day periods over the span of six months. Fish biodiversity will be measured before and after trap deployment using three techniques. In the first, Noyes will deploy underwater video cameras—called baited remote underwater videos, or BRUVs—which are mounted on metal frames and baited to attract fish into the viewing and recording area. Second, Goodbody-Gringley will conduct underwater surveys of fish populations. Finally, Blanco-Bercial will use next-generation DNA sequencing methods and technologies to study environmental DNA. Organisms continually release environmental DNA, or eDNA, into their surrounding environment. Common sources of eDNA from fish include waste material, old scales, mucus, and reproductive cells. By taking water samples from the area around the lionfish traps, Blanco-Bercial can extract genetic material and sequence it to identify each fish species present in the area at the time of the sample. “Unlike other survey methods, eDNA has the ability to correctly identify a higher number of species, including hidden species that may not be easily seen by cameras or divers,” Blanco-Bercial said. The key to the success of the eDNA component is yet another research project: a collaboration between Noyes, Blanco-Bercial, and the Bermuda, Aquarium, Museum, and Zoo (BAMZ). In order to correctly identify the fish species present, scientists must have a reference database of DNA sequences against which to compare the samples. Last year, with funding from the Bermuda Zoological Society’s Research and Conservation Council, Noyes and Blanco-Bercial, along with their student interns from Lehigh University and Colorado College, began taking tissue samples from the collection of more than 240 species currently housed in the Natural History Museum at BAMZ. To date, the team has sequenced more than half of the most common fish in Bermuda. 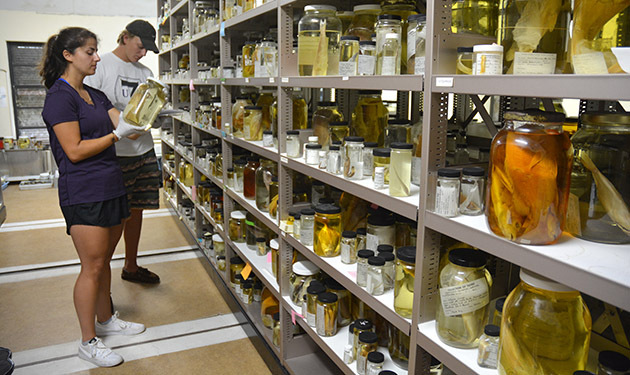 Among hundreds of preserved fish at the Bermuda Natural History Museum, BIOS interns Jonas Schroder (right) and Maria Granquist (left) select specimens for DNA sequencing. “We are benefiting from the work conducted by taxonomists who have identified these fishes to species level. When we’re finished with our analyses, the DNA sequences and any remaining DNA material will be given to BAMZ to grow the collection and benefit future research,” Noyes said. Together, these three research projects offer a holistic approach to understanding the effects of two targeted lionfish removal techniques—spearing by divers and the NOAA lionfish-specific trap—on Bermuda’s reef fish populations. By combining multiple methods of assessing fish biodiversity, the teams can more accurately establish a baseline for community composition (such as the abundance and diversity of fish species) and better understand the response of these communities to lionfish removal. With all three projects anticipated to be finished in the next two years, the teams hope to be able to share their findings with both Bermuda-based and regional lionfish management initiatives.